The first week of the One Room Challenge flew by! Seriously, I can’t believe that we’re in the second week already. I’m going to rate my progress as a 6/10 for this first week. While I didn’t get as much done as I had planned, it could have been worse. 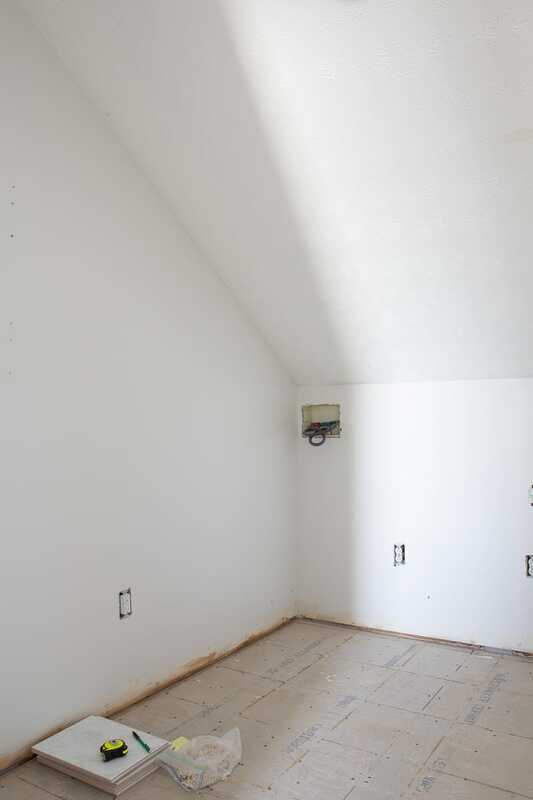 I was able to complete all of the demo and put three coats of paint on the walls. 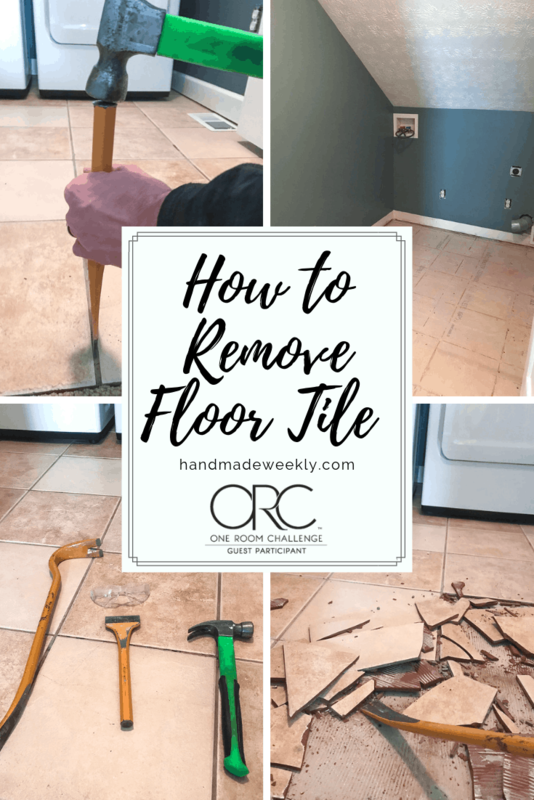 Today I’m sharing all of my progress along with a full tutorial on how to remove floor tile. Before I get into the details of the demo and painting I want to remind everyone of what I started with. Below is a picture of my original laundry room. You can find the full design details in last weeks post. Saturday was all demo. 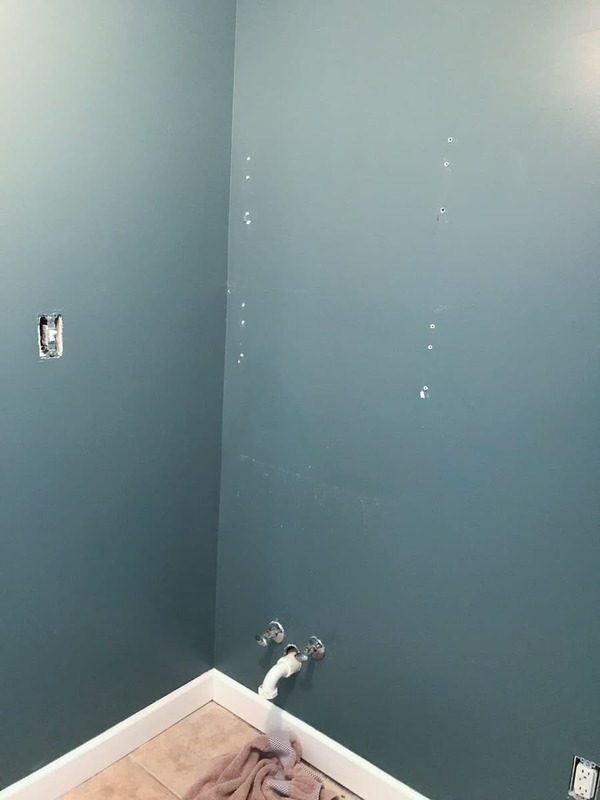 I started by removing the utility sink and the wall shelves. After that I enlisted the hubby to haul the washer and dryer out of the room. We have a hand cart so that definitely made the job easier for him. 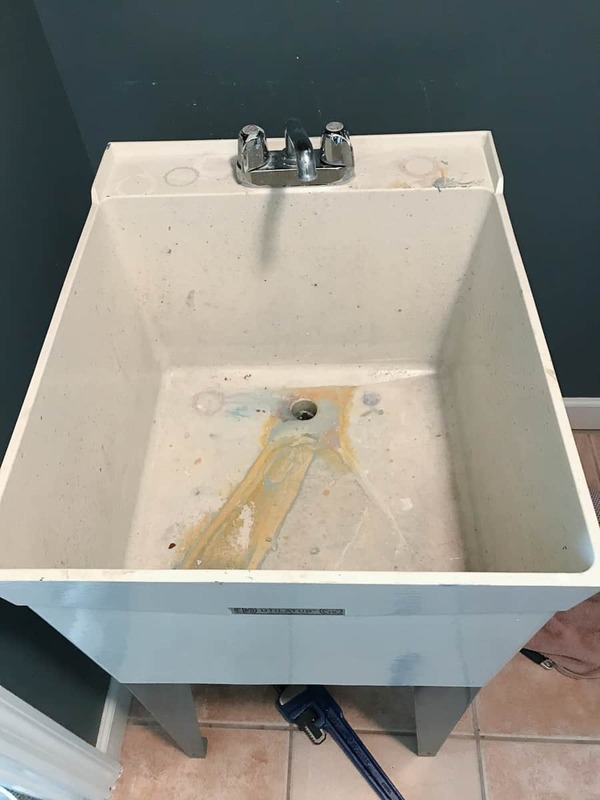 My existing utility sink worked just fine, but it was all stained up and overall pretty darn gross. After everything was out, it was time to break away the old ugly floor tile. 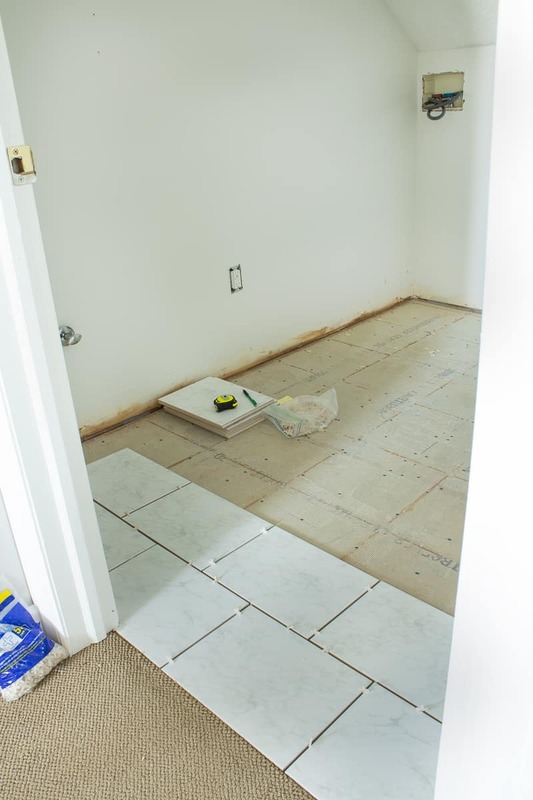 Since my blog is all about tutorials, I figured I’d share my process for removing floor tile. 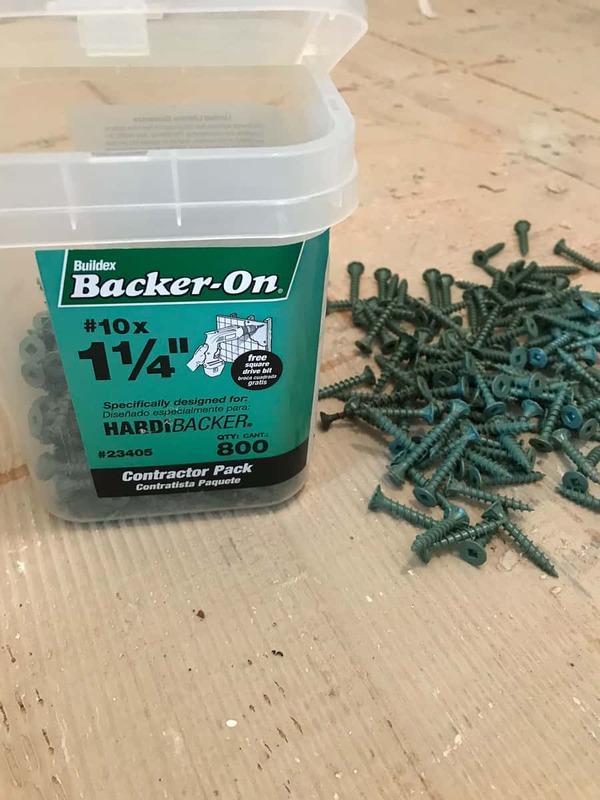 Before you get started, I would recommend a few tools. This post contains affiliate links, meaning, at no additional cost to you, I will make a commission if you click through and make a purchase. First off, I would like to point out that my washer and dryer are still in the room in the picture below because I was finishing up my last load of laundry and didn’t have the patience to wait for it to finish. We removed the first few rows of tile and then when the loads were finished we moved the washer and dryer out. 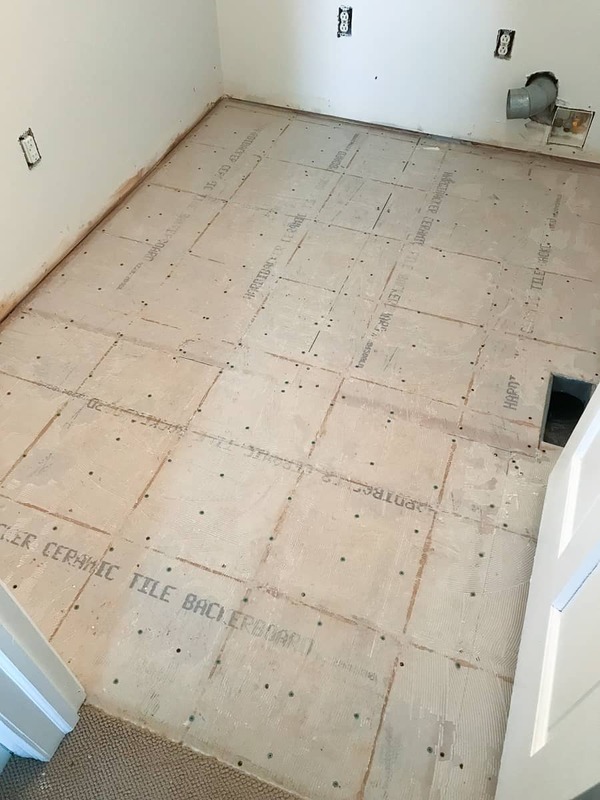 We also thought we could get away with not removing the base boards but it ended up being difficult remove the floor tile from under them so I’d recommend to remove the base boards before you get started. 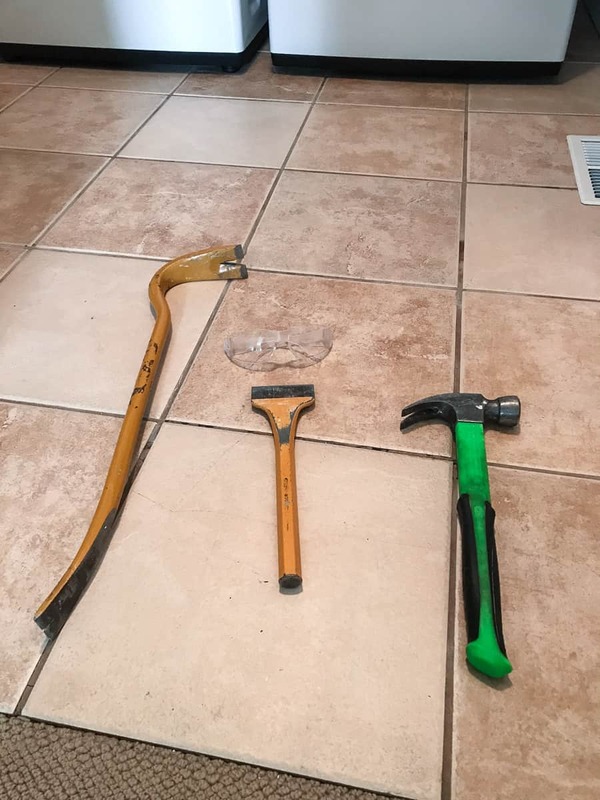 Break up the grout using a chisel and a hammer. 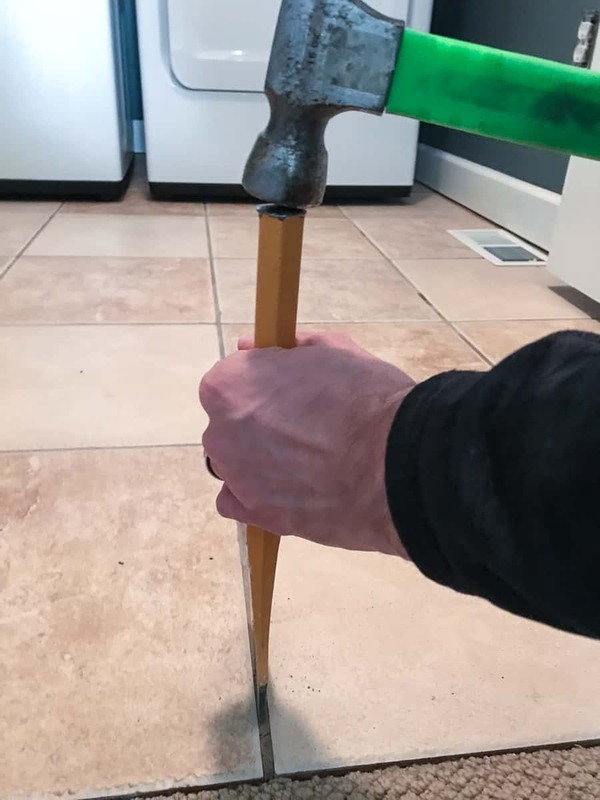 Once you have some leverage under a tile you can use the wrecking bar to break the rest of it up. 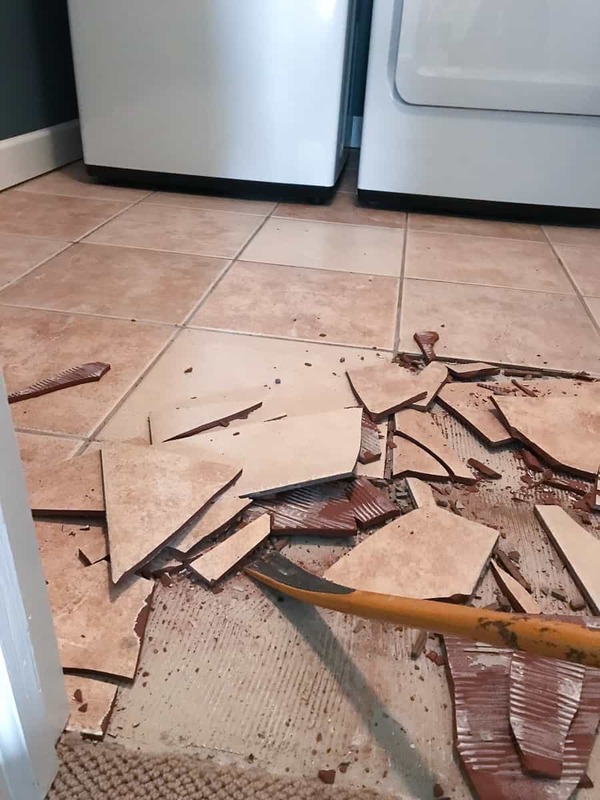 I filled 5 gallon buckets with the broken tile to haul it out of the room. 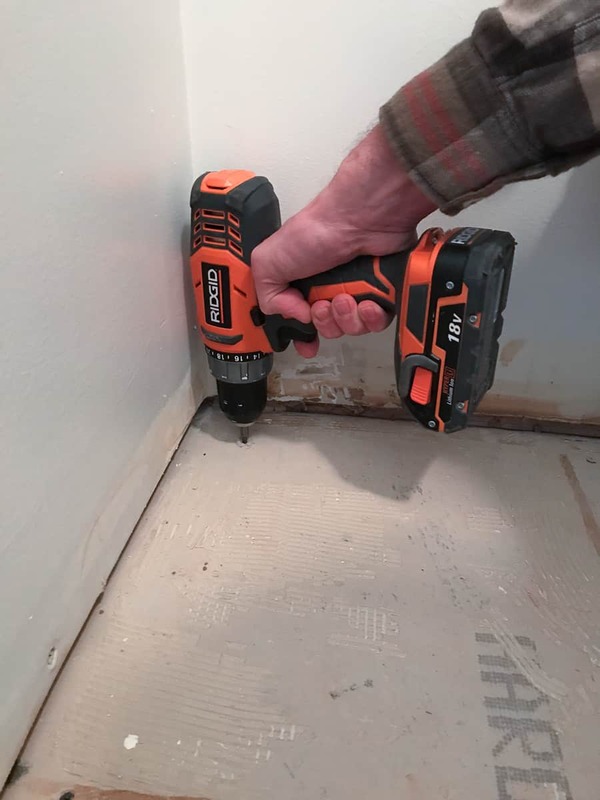 to remove the excess thinset and get a level surface to apply the new tile. left over from my bathroom remodel so I just added them where they should have been and now I have a super solid base to tile over. 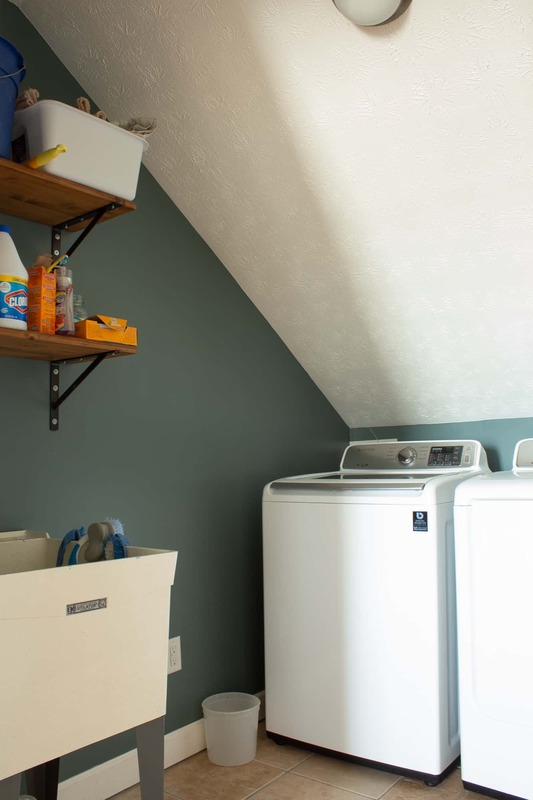 3 years ago when we moved in, the laundry room was the first room that I painted in the house. I went with a dark teal color which at the time I loved but over the years I’ve trended toward light neutral wall colors. This time around I knew that I wanted a very light gray/almost white wall color so when I came across weathered white by Behr I was sold. I didn’t even get samples, I just went for the entire gallon. Does anyone else do that? I see other people getting 5-10 different samples, slapping them on the wall and over analyzing which one is perfect. Not me! I’m just like “yeah, that’ll work”. Maybe 3 years from now I’ll paint it again 😉 The pictures really don’t do it justice. It has a slight gray/tan hue but for some reason it looks stark white in these pictures. And that’s a wrap for the first week! Here is a picture after I started planning out the tile. I’ll be laying the new tile this weekend and will share that process next week! 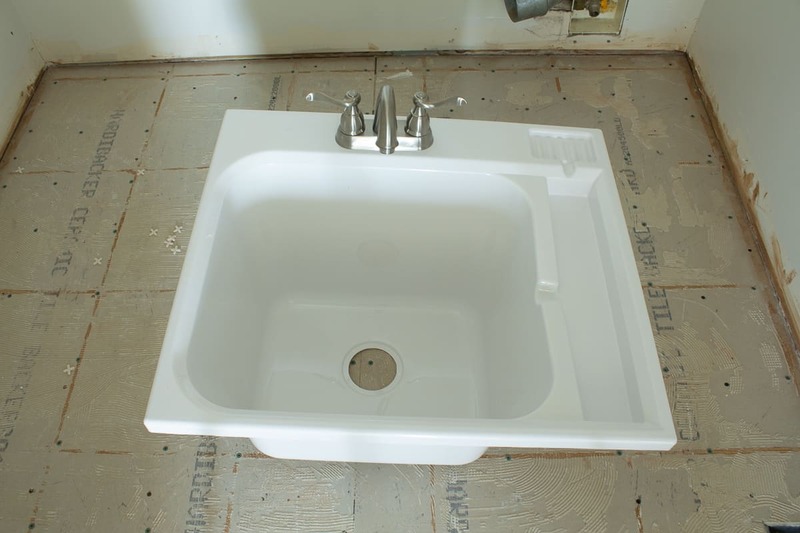 I also got my drop in utility sink and a faucet set last week. This week I’m going to start planning out my woodworking plans for the sink base but I probably won’t start actually building it until the following week. Let’s be real, laying the new floor is going to keep me busy enough this weekend. 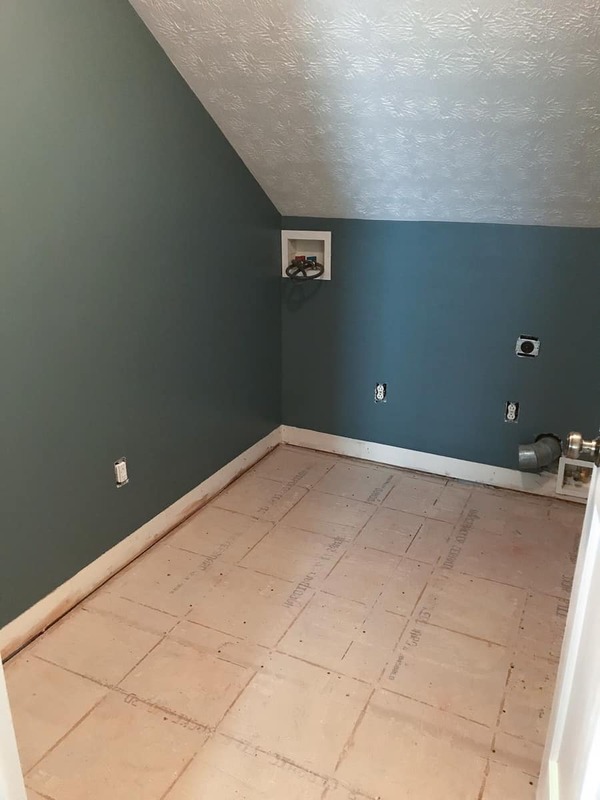 You can visit the One Room Challenge blog to see room transformations from several bloggers. They have featured and guest participants. 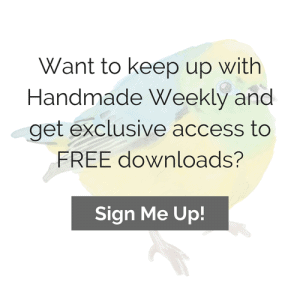 If you would like to check out my week one post you can find it here. Thanks so much for stopping by. I’ll be posting my progress each Thursday for the next four weeks with the final reveal posted on Thursday May 9th. Follow me on Instagram Pinterest and Facebook to get a glimpse of my progress before Thursdays and access to my other tutorials and recipes.